The key to domain taste testing is to take advantage of a five-day grace period offered by select domain name registry services. After doing careful research to identify and determine the commercial resale value of a domain name, the investor purchases the domain through the registrar and begins to immediately test its worth. Different domain name investors may use a variety of different strategies to put a new domain through its paces including setting up Google AdSense ads to generate click-through commissions through text ads to setting up more extensive web sites with hundreds of pages of related content and products related to the domain name. Using links to existing affiliate products and programs, reseller products, or links to online stores such as Amazon.com or Target.com, even a one-man shop can create a domain rich with products and custom offerings without ever having to stock a single physical product on a shelf. Within a five-day grace period, the domain name investor can usually determine the ability of the domain to turn a hefty profit. If the name fails to attract traffic or generate satisfactory click-through commissions or product sales, the domain name can be returned to the domain registrar and the registration fee refunded towards the purchase of a new domain name. 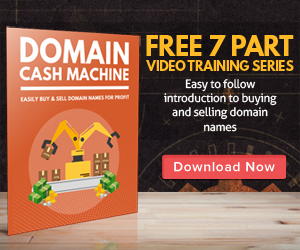 In this way, a savvy domain name investor can continuously test a variety of domain names to determine the best ones to hold onto for future expansion or resale. Just as fine wine increases as it ages, domain names can also improve with age and resell for substantially more dollars the longer they are held. And just as entire wine collections are frequently passed from one owner to the next, entire collections of related domain names are also frequently resold through multiple owners for ever-increasing profits. In what other industry can a speculator have this level of flexibility in his investment? Imagine if you could purchase stocks and bonds through your stock broker this way how much money you could generate? It’s no small wonder why the domain name industry is quickly growing into one of the largest and most aggressive investment markets in existence. By 2010 it is estimated it will grow into a $4 billion market.